Emma-Jayne met her husband Malcolm when she was in her teens and they both knew they wanted children. “I was 19 when we first started trying and I am now nearly 26,” recalls Emma-Jayne. “As time went on it got harder. I was working with children with disabilities and pretty much all my friends had children. I got emotional every time someone said they were pregnant; it was very very difficult. After five years the couple went to their GP. A HyCoSy test showed Emma-Jayne’s fallopian tubes were clear but Malcolm had a low sperm count and low motility. Fortunately, the couple were eligible for NHS funded IVF and they chose Bourn Hall clinic in Colchester for treatment. As they live in Ipswich, Colchester was the closest Bourn Hall clinic and they started treatment at the end of 2015. “We were advised to try ICSI,” continues Emma-Jayne. “This is where one sperm gets injected into an egg to help with fertilisation. “I started my injections to stimulate the ovaries in February 2016 and was scanned every other day to decide when to take the eggs out. “I produced 11 eggs; ten eggs were inseminated and nine eggs fertilised, but only one made it to day five, blastocyst stage, and this was put in my womb. “It didn’t feel real even though I had been preparing myself the previous month. I was told to carry on with daily life, but no heavy lifting etc., then wait for two weeks to take the test. That was when problems started. “The nurse said it may not be an ongoing pregnancy as there was not enough amniotic fluid in the sac. It had stopped growing at six weeks, at ten weeks the heartbeat was low and at 11 weeks there was no heartbeat. The baby had died. “This counts as miscarriage and we were heartbroken. Bourn Hall cared for us through to that point and then we went to Ipswich Hospital to confirm there was no heartbeat. The couple still had the option of another cycle of NHS funded IVF so Emma-Jayne phoned the GP and asked to be referred again. “I had a higher dosage this time and was having injections all over Christmas. Just after New Year 2017 the eggs were taken out. I got 17 eggs and all of them were fertilised; just one looked as though it had made it so I took that one chance. “I missed a period in the two-week wait but after one week and five days I started cramping so I rang the clinic. They said this can happen but I knew in myself it was something to worry about and that night I had heavy bleeding and I knew it was game over. Emma-Jayne is pleased that they had the chance to try IVF. “I wouldn’t be the person I am today if I hadn’t given it a try. We had a positive experience at Bourn Hall and amazing encouragement and support from family and friends so we just carried on. “I found me and Mal became closer as a couple and a lot stronger seeing each other go through such heartache. 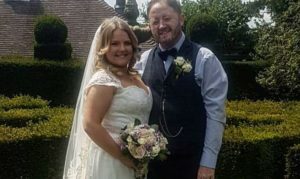 The couple are moving on with their lives: they got married in July 2017 and Emma-Jayne now juggles running her own business selling gifts, handcrafted chocolates and arranging bouquets, with caring for her grandma. “I am never going to forget it, and it is always on my mind – especially when, for other people, becoming pregnant and starting a family seems an easy process and has been so hard for me and Malcolm. If you are or have been a patient at Bourn Hall at would like support about making decisions such as this we offer fertility counselling.